You must make reservations at least 5 minutes in advance of the time at Flamant. Small lot with available parking. Most parking on the street. We have a full service catering company. We can do a private dinner for 2, corporate events and high end events such as holiday parties and weddings. Serving Brunch all day from 11 - 8. Come join us for Chef's Famous Fried Chicken, Apple French Toast, Lobster Rolls and many other delightful options. Beautiful setting. Well-prepared help. Hostess and server were top notch. Drinks were refreshing. Various seating arrangements can accommodate a variety of party sizes. Thank you for your service. We will be back to try your outdoor seating area. First time visiting and expectations were met. Love a simple menu with high quality. Understand it changes every few months. For all the stellar reviews, we found it to be adequate. Nothing spectacular and somewhat pricey. We love this restaurant! Innovative, delicious food. Great food experience. Close tables and loud neighbors made for a less than perfect experience. But the food made up for any shortcomings. Birthday celebration dinner. Ambiance is great! I liked the fire pit out front. Next time we will come early and enjoy a glass of wine out front. Menu revolves, which keeps it interesting. Don’t miss the MD Crab rolls with Gin flavored dipping sauce appetizer that is a standard on the menu. I had the Tarragon Chicken Schnitzel, Wow! My wife had the Tilefish with a spinach flan, which she thoroughly enjoyed. The wine by the glass list is limited to a few choices in different varietals. You can definitely find a wine you will enjoy, but I wish the wine by the glass list was a bit more expanded. 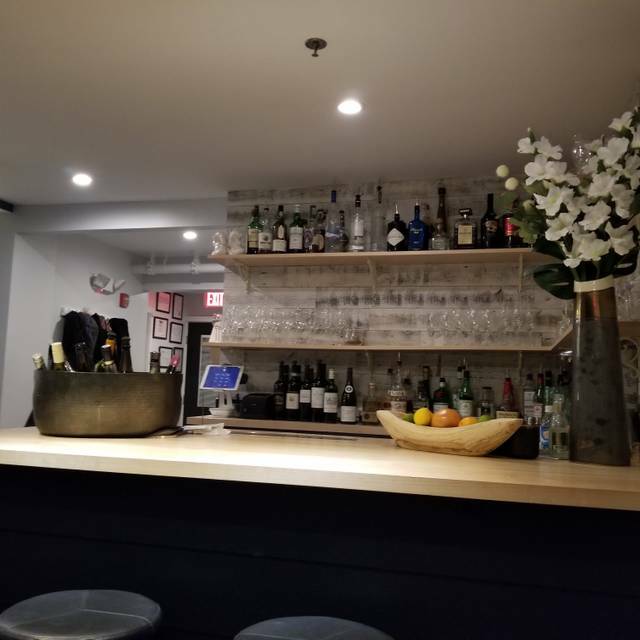 Flamant is an Annapolis gem and I highly recommend you try it! The service, though there was only three tables, in the middle of the week was very slow. I ordered the chicken which was very dry. It came with a large oyster mushroom halved and which was meaty and ok but I'd only recommend for adventurous diners who really like unusual mushrooms. My husband ordered the char which he liked since it's very like salmon and he really enjoys salmon and the bread was really good, served with a herbed and peppered olive oil. The waiter was attentive and pleasant. My daughters and I recently enjoyed a delightful dinner at Flamant. We greatly enjoyed our appetizers, entrees and desserts. The service was excellent, and the atmosphere was pleasant. We are certain to return. Our third visit, more enjoyable due to the new space in the back with cathedral ceiling. Ramp entrance is appreciated. We will be back soon. Impeccable. Wouldn’t change a thing! Looking forward to returning soon. Flamant is a joy, s gem, a fabulous dining and social gathering place. You will NEVER be disappointed. Lunch or dinner-my Annapolis Go To! Food was innovative and very tasty. Beautiful presentation, creativity and most of all flavor. Drinks were good, although wine selection could be a bit bigger with moderately priced wines from about $40.00 - $60.00. The only challenge for the evening was the waitress who was very forgetful and not knowledgeable about drinks, liquor, etc. When asked what type of Scotch they had, she said she didn't know because she doesn't drink scotch. She was missing the point that you may need this information for your customers. She could have referred to the menu which had the list of Scotches. In addition, she forgot the drinks all together and it took reminding to get them to the table. But hey, good restaurants can suffer the plight of poor customer service, as well as any other business. Get it. This was my second visit; first visit in 2018 was better. Kale salad was very good. Shrimp over frisée lettuce was average. Mushroom cappuccino also average. Side order of fries and dessert donut were great. Will come again but pay more attention to offerings. Flamant is quite simply the best restaurant we have in Annapolis, and it's always a treat to go there. Dishes change seasonally and are always interesting and slightly off beat, which I love, like monkfish, or the cauliflower mousse inside a crispy morsel the other night --divine! The baked-in-house bread is outstanding, the staff is always attentive, and the setting is intimate and welcoming, especially in winter in the back room. To have a restaurant with a European sensibility in a town full of mediocre seafood dishes is one of the great joys of living here. Go for a special occasion --you won't be sorry! The food is far superior to most restaurants in Annapolis, but that really does say much because the bar is so low in Annapolis. 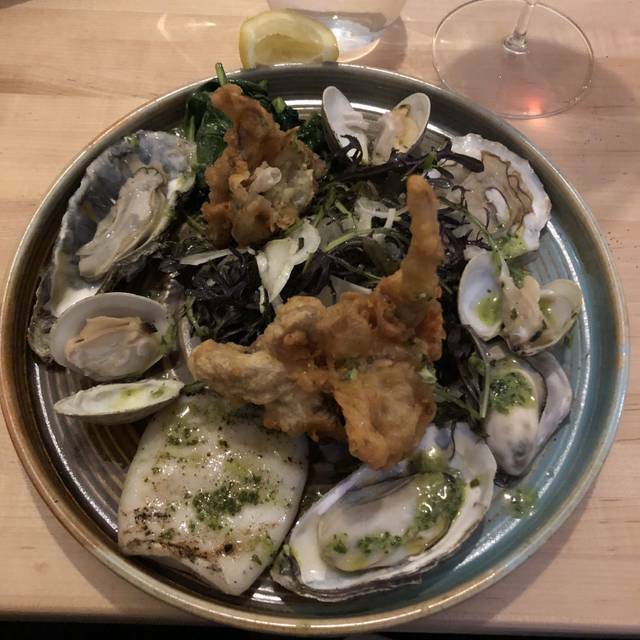 The food is excellent and on par with what I would expect to find in DC, Miami, or Charleston - all cities I visit regularly, all of which have vibrant restaurants. The decor is very quaint and clean, which I like, but even on a slow night with very few tables, the noise level was higher than I would like. All of the surfaces in the space are hard, so the noise from the diners (trained to scream at each other by other local restaurants) echoes around and recycles itself. The woman who greeted and showed us to our table and the server were lovely. Well mannered and soft spoken, they were true hospitality professionals. Maybe the issue was a very loud Birthday party, but the back dining room was just loud over all. The food was very good and the service was excellent. The evening just wasn’t as enjoyable as our first experience. It seemed as though all of the patrons were together while the front areas were empty. Gorgeous restaurant in West Annapolis with a unique feel. Just what Annapolis needed. Excellent high-end dishes with terrific service. Very comfortable fine dining with an attentive personable staff. Even on a busy Saturday night, the pace was calm. Very enjoyable. Surprisingly beautiful setting and memorable dishes. The mushroom cappuccino, farmers egg salad, and veal shank stood out, but every bite was delicious. I'd say the flan was a little more like budino than flan (not very jiggly) but we were still angling for the last spoonful. Looking forward to returning! Flamant is both elegant and comfortable. Our meal was incredible! We will definitely be back. Fantastic — one of the best restaurants in Annapolis and the entire DC metro area! The food was not as good as I expected. The venue is great. The service was excellent! Birthday celebration during restaurant week. Very creative crunchy kale chip salad with cauliflower slices, raisins and agrodolce dressing. Addictive! Great fries too! Enjoyed it all! Second visit, deeply impressed. Frederich knows food!!! First time and we we will be going back! Celebrated friend's birthday at Flamant and no one was disappointed. Excellent menu and wine pairing, very friendly service, easy parking and good location in Annapolis. Wonderful date night during Restaurant week in Annapolis. The service, meal and wine pairings were excellent. Cozy feeling of an exclusive club with great food. Loved the house gin & tonic as well. Can’t wait to try the outdoor space this spring! It was restaurant week, I didn’t know, and only a set price 3 course meal was offered. I wouldn’t have chosen the offerings normally and I wouldn’t have ordered dessert. Not the experience I expected but will go back to try the menu. Food was great. Loved having the fire going in the back room, created a very homely feel to the experience. Food was outstanding. Would love to see maybe a mocktail or 2 on the drink list, for those who don't drink alcohol. With how creative they can be, I feel it would be a nice touch. Service was excellent. Our waiter, on seeing that I hadn't drunk much of my (half price for Restaurant Week!) fancy cocktail, asked how it was. I admitted it was not really to my liking but it was worth trying. It was not a complaint. He offered to make me a different one and asked what I typically liked. I got a new, different cocktail at no extra charge. Food is different and interesting. The fried kale salad was delicious. I would go back for that. My pork schnitzel entree was tender and tasty. DH enjoyed his salmon. Hi chicken liver pate appetizer was rich, a generous portion and came with good bread sticks. We shared a side of "Welsh fries" which were fine but not special. Chocolate mousse for dessert looked like just a dollop in a glass, but it was very rich so the portion was just right. The other dessert we shared was a sort of chocolate/vanilla sundae that was very good. First visit during Restaurant Week and thoroughly pleased. Kale salad crisp and sweet with just the right amount of flavor from golden raisins. Salmon exceptional and a nice portion evenly cooked. We had a corner table in the front room which was cozy but could hear the neighbors conversation for business on one side and the lover's confessions on the other. Adds to the quaint charm of the restaurant in some aspects, but intrusive on others. Fireplace (back) room looks more appealing. Lovely spot and nice addition to the walk/jam/noisy crowd found in Eastport or along Main Street. We have been here before and enjoyed the experience. This week is restaurant week and Flamant has a nice set menu with a wine pairings for the first two courses . This time we sat in the back room and it has a fireplace running this time of year. Very nice with the cold season. The things we tried were chicken liver mousse and figs and the ginger-carrot risotto appetizer both were generous portions and very good. The main dishes that we tried were a salmon dish and pork schnitzel . Again both very tasty. This is a foodie place with a casual atmosphere . A great addition to Annapolis restaurants! The food was top notch. I loved the open kitchen and being able to watch the chef prepare the food. The menu changes every 3 months to keep the menu options fresh and seasonal. We didn’t know it was Restraunt week and were pleasantly surprised by the menu for the night. Great pork and liver mouse. We love the intimate vibe and outstanding service.